Stars Over Washington: Horoscope: The Confederacy--and a "dark vein of intolerance"
Horoscope: The Confederacy--and a "dark vein of intolerance"
You've probably heard by now that Colin Powell recently described the Republican Party as having a "dark vein of intolerance" which seems a spot-on analysis to this particular southerner. Particularly since the natal horoscope of the Republican Party (July 6, 1854 5:00 pm LMT Jackson, Michigan) shows the dark planet of veins, tunnels, and other deep locations, Pluto, posited in Venus-ruled Taurus, sign of gardening, building, preserving, gold-loving, and luxury with its shadow side of greed, stubbornness, prejudice, and intolerance. Thus, a "dark vein of intolerance" runs deep within the *era of the party's inception in 1854, a few years prior to the outbreak of the Civil War. Slavery of those who were seen to be 'lesser than' is the 'dark elephant in the room', of course, but such a massive topic is beyond the scope of this post even as racism winds its insinuating snakiness around this nation's heart--still, as we hear from the rhetoric and 'code words' of Republican Party members and other Americans who hold such vile persuasions based on their alleged superiority. Another implied condition of influence is the hard-fought progress of the Civil Rights Movement/s championed by Rev. Martin Luther King Jr which roiled America during the 1960s when the restless and rioting combination of Uranus and Pluto met in Great Conjunction in mid-Virgo at the critical-crisis degree of 17 Virgo. So this weekend, we have President Obama's second Inauguration, privately on Sunday January 20th and publicly on Monday January 21st--Martin Luther King Jr Day--and social conditions may be on the boil in America particularly when future anti-gun-violence measures are tossed in (see video below.) 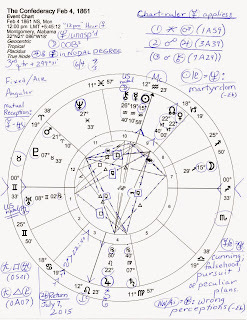 As you know, generational Uranus and Pluto are in and out of a square aspect (obstacles, blockages, frustration) in the globally-affected Cardinal signs of Aries and Capricorn, exact since 2010. Thus civil rights troubles regurgitate. And of course you know of Richard Nixon's campaign ploy in 1968 to use the Southern strategy and the Republican Party has been skewed (and in my opinion, damaged to the core) by holier-than-thous ever since. Makes sense that the GOP's much-touted "soul searching" that would supposedly take place after their loss of the White House on November 6, 2012 never actually occurred for look at the misshapened beast of intolerance they'd have to face if they looked deeply enough. My suspicion is that party leaders took a brief peek as they kneeled down, then renewed their vow of subservience. Below you see the natal horoscope of The Confederacy which, like the Republican Party horoscope, contains Pluto in Taurus. Plus, Pluto is in the 12th house of The Unconscious, Karma, and Self-Undoing. Many things are hidden in the 12th houses of all horoscopes and here we see that the planet of war and conflict, Mars (strong in its own sign of Aries, the warrior and pioneer), hides near the cusp, ready to break out at any moment into the more visible 11th house of Groups, Associations, Hopes and Wishes. And with foreign bankers to motivate and support them and with independent trade a major concern, southern planters, businessmen, and their sons were ready as firecrackers when the first shot began the Civil War near Charleston, S.C. Hour of Venus; Moon out-of-bounds (emotional insecurity) in adventurous Sagittarius; a Kite pattern of success but its 'tail'--Jupiter @22Leo (a degree of 'mastery') is Rx and I believe, along with Saturn Rx represents the foundation (4th house) of the southern cause's support system--the House of Rothschilds which controlled the British government (Saturn) and monarchy (Jupiter in royal Leo); Sun 15AQ59 with Mercury 19AQ13 (the 'nose' of the Kite) and wounding-wounded Chiron in 10th house of Worldly Status. Testy Mars is also involved in the Kite configuration along with the Sag Moon ruled by Rx Jupiter; Venus conjoins NN at Nodal degree--more 22s of 'mastery' (which in this case reminds me of slavery.) The Confederacy's natal Venus-NN conjunction was stimulated by the New Moon of January 11, 2013 at that degree. With a swoon of synchronicity, a New Moon at the same degree occurred on January 11, 1994 (a time link!) which plays into the Republican take-over of the House by Newt Gingrich and his minions--and the subsequent government shut-down the GOP so enjoyed and with which they again threaten our nation's economic standing if they don't get their way: Act Two, one supposes. 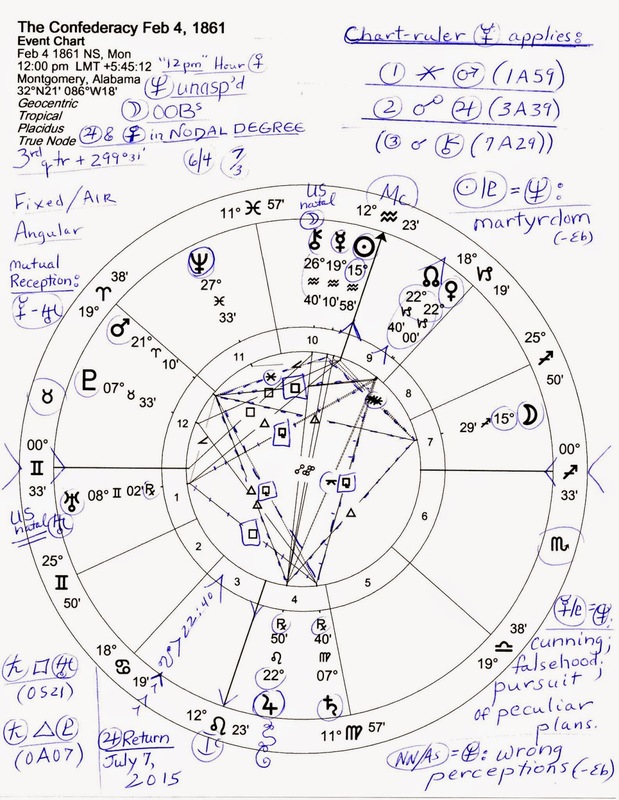 Astro-note: the above chart data is taken from Campion's The World Book of Horoscopes which shows an Ascendant of 00Gem34, the degree of the May 20, 2012 Solar Eclipse with Mercury-Pluto content ("an obsessive idea finally accepted; success after much hard work"--paraphrasing Brady's Predictive Astrology. As you well know, an African American president will continue to inhabit the Oval Office for four more years, a fact that Republicans refuse to accept in their deep stubbornness and intolerance of 'the other'. And this selfishness is displayed no matter how their theatrical political stunts hurt the American people or how easily their sorry strategies may collapse global markets. Yes, the entire world will have the Republican Party to 'thank' if financial matters 'go south'! Plus, curiously, the IC Point of The Confederacy chart @12Leo25 (its Foundation or Basis) conjoins the natal Sun degree of President Obama! Edit 3.2.16: video removed so the code is removed but I hope you've listened to Colin Powell, above, for the result is the 2016 candidacy of Donald Trump who pretended confusion over the identity of Klansman David Duke! Talk about racist dog whistles, Trump has them in his back pocket during each of his speeches (aka, ramblings). It seems to me that those of a Confederacy mindset ought to be ashamed of their backwardness and regressive primal tendencies but apparently such self-awareness is completely missing in many of them. Which is somewhat odd considering that The Awakener, Uranus (but also The Rebel and Anarchist) is rising (edit 3.2.16: and 2016 candidate Bernie Sanders is calling for a political revolution in an attempt to save our country for the sake of We the People). Well, perhaps not so odd for revolutionary Uranus for, as they've brashly threatened on many occasions, The South Shall Rise Again! Q: do racism, intolerance, and primal violence have to rise with it? *In the Tropical Zodiac, Pluto lumbered through the 30 degrees of Taurus from 1852 to 1884, leading up to and encompassing the American Civil War with its massive death count made higher by disease, infection, and gruesome surgeries (Pluto), and in part, was in effect during the era of the Industrial Revolution/s when many social transformations took place.